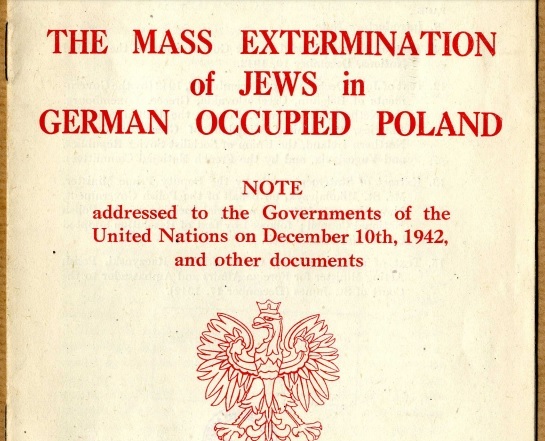 We publish the Note (report) of Minister Edward Raczyński, the Polish Minister of Foreign Affairs (1941-1943), on the Mass Extermination of Jews in German occupied Poland. The note of the Polish Government in Exile was sent on December 10, 1942 to the governments signatories of the Declaration of the United Nations and it urged the allied governments to undertake all possible measures to stop war crimes perpetrated by occupying German forces. “In the course of the last three years the Polish Government has lodged a number of protests with the Governments of the civilized countries of the world condemning the repeated violations by Germany of International Law and the fundamental principles of morality since September 1st 1939, i.e. since Germany’s aggression against Poland. 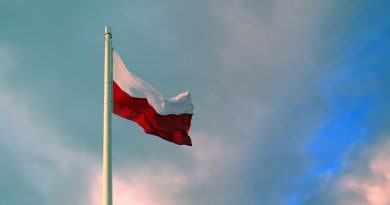 In the Note of May 3rd, 1941, presented to the Governments of the Allied and Neutral Powers the Polish Government gave a comprehensive survey of the acts of violence perpetrated against the population of Poland, of offences against religion and cultural heritage and destruction of property in Poland. An extract of this Note, together with a large amount of corroborating material, has been published in the form of a White Book. The document of the Polish Government in Exile was based among others on witness testimonies of Jan Karski, a Polish World War II resistance movement fighter, diplomat and later professor at Georgetown University. Karski reported to the Polish, British and U.S. governments on the situation in Poland, especially on the destruction of the Warsaw Ghetto and the Holocaust of Polish Jews. He had also carried out of Poland a microfilm with further information from the underground movement on the extermination of European Jews in German-occupied Poland. Karski met with Polish politicians in exile, as well as members of political parties such as the Socialist Party, National Party, Labor Party, People’s Party, Jewish Bund and Poalei Zion. He also spoke to the British Foreign Secretary Anthony Eden, giving a detailed statement on what he had seen in Warsaw and Bełżec. He then traveled to the United States, and on 28 July 1943 Karski personally met with President Franklin D. Roosevelt in the Oval Office, telling him about the situation in Poland and becoming the first eyewitness to tell him about the Jewish Holocaust. During their meeting, Roosevelt asked about the condition of horses in Poland. Roosevelt did not ask one question about the Jews. Karski went on to meet with many other government and civic leaders in the United States, including Supreme Court Justice Felix Frankfurter, Cordell Hull, William Joseph Donovan, and Rabbi Stephen Wise. Frankfurter, skeptical of Karski’s report, said later “I did not say that he was lying, I said that I could not believe him. There is a difference.” Karski presented his report to media, bishops of various denominations (including Cardinal Samuel Stritch), members of the Hollywood film industry and artists, but without much result (Wikipedia). The Allies did nothing to prevent the mass extermination of Jews in the Nazi German death camps and in Jewish ghettos. The Auschwitz camp was primary built for Poles, but it later became the most notorious extermination camp of the Jewish nation. Upon their arrival, the Poles lined up in five rows and were met by Hauptsturmführer Karl Fritzsch, who announced: “This is Auschwitz Concentration Camp….Any resistance or disobedience will be ruthlessly punished. Anyone disobeying superiors, or trying to escape, will be sentenced to death. Young and healthy people don’t live longer than three months here. Priests one month, Jews two weeks. There is only one way out — through the crematorium chimneys”. Edward Raczyński, who was also the last Polish President-in-Exile (1979–1986, United Kingdom), was not able to convince the governments of allied countries. 6 million Jews, including 3 million Polish Jews (90% of the Jewish population), 3 million ethnic Poles and many others perished in one of the most barbaric wars in the history of mankind, the Jews mainly in the German death camps.